It beginning to look like the Crimson Tide will easily roll through Baton Rouge this Saturday night. Bovada lists the No.1 Alabama Crimson Tide (8-0) as a 14.5-point favorite on the road against the No.4 LSU Tigers (7-1) for Saturday’s prime-time matchup between two AP Top-5 teams in the biggest game of the college football season so far and will likely decide which team goes to the SEC Championship. Here is the entire betting line from Bovada, which includes the money line and over/under odds that were posted Wednesday. Keep in mind that both teams have a record of 5-3 against the spread this season. The Bovada point spread seems to be the consensus among Las Vegas and other online sports betting sites as well with each setting the opening spread at either 14.5 or 14, favoriting the top-ranked Crimson Tide. The College football betting line for Saturday’s showdown in the bayou is indicative of how dominant Alabama has been all season. Since the turn of the century, no AP Top-10 team has been a double-digit underdog at home. In fact, LSU has not been this big of an underdog at “Death Valley” since October 11, 1997, when the No.1 Florida Gators, the defending national champions, were a 16.5-point favorite against No.14 LSU. The Tigers would go on to upset the Gators by a score of 28-21. The Crimson Tide look to be on a historic pace in 2018, scoring 54.1 points per game, which is best PPG average in the country, while boasting a top ten defense allowing only 15.9 PPG. In addition, the team is led by the Heisman Trophy front-runner QB Tua Tagovailoa, who is having one of the best seasons ever for a quarterback with 2,066 passing yards, 25 TDs to 0 INTs while competing over 70% of his passes. On the flip side, No.4 LSU comes into the matchup having defeated three top-10 teams this season with the last of these being most impressive – mauling the defending SEC champion and then-No.2 Georgia Bulldogs 36-16. Georgia was a 7-point road favorite in that matchup. The Gators handed the Tigers their only loss this season, winning 27-19 in a back-and-forth contest in Gainesville that saw the Gators seal the game on a pick-six in the final two minutes of play. LSU has bounced back since then, defeating both Georgia and Mississippi State by double digits. While the Tigers may only score an average of 30.4 PPG, the Tigers defense has been statistically been better than Alabama, ranking No.7 in the country and allowing only 15.1 PPG while facing one of the toughest schedules in the country. One thing to keep in mind is LSU star linebacker Devin White, who leads the team in tackles, is suspended for the first half against Alabama due to a targeting ejection called during the Mississippi State game. Both teams are coming off a bye week, and LSU will look to defend its perfect 5-0 record at home this season. 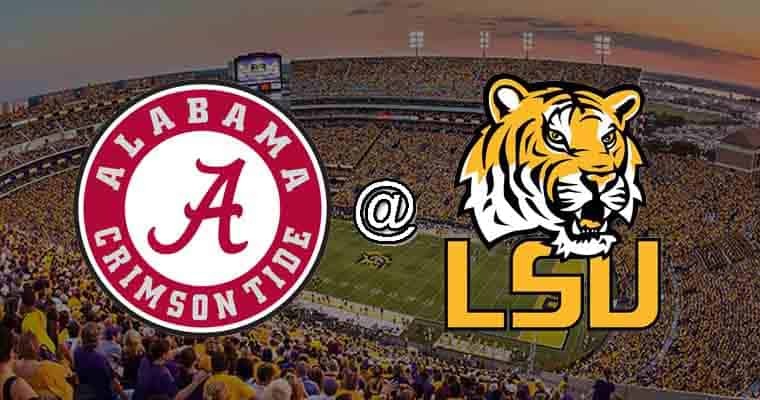 The game will air on CBS, and kickoff is set for 8:00 p.m. on Saturday, Nov. 3rd at Tiger Stadium in Baton Rouge, Louisiana.